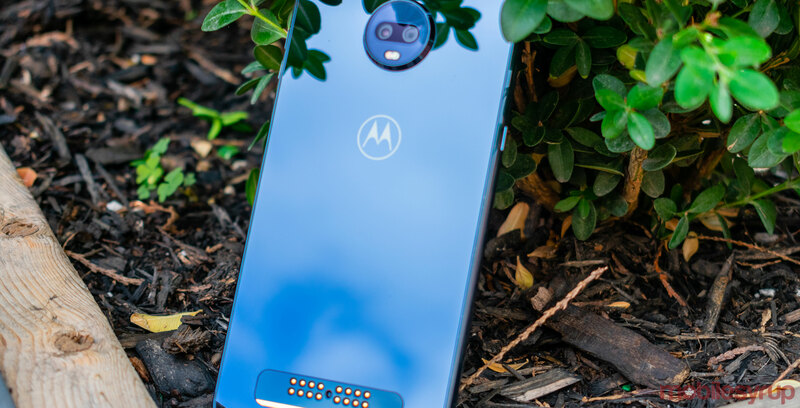 Lenovo-owned Motorola’s Moto Z3 Play might just be the best Z-series smartphone ever released by the company. It’s elegantly designed, comfortable to hold, has an impressive camera and comes with a number of extras that are not only useful, they’re tucked away and don’t distract from the phone’s overall user experience. Despite my compliments, however, the Z3 Play is an upper mid-range device unfortunately priced as a premium-tier Android flagship competitor. While the phone is impressive, it’s high price point will no doubt make it a tough sell to most people looking for a new phone. Stare at the Moto Z3 Play, and you’d be forgiven for assuming it’s a flagship smartphone. The device’s 6.01-inch, 1080 x 2160 pixel, Super AMOLED display is flanked by thin top and bottom bezels. 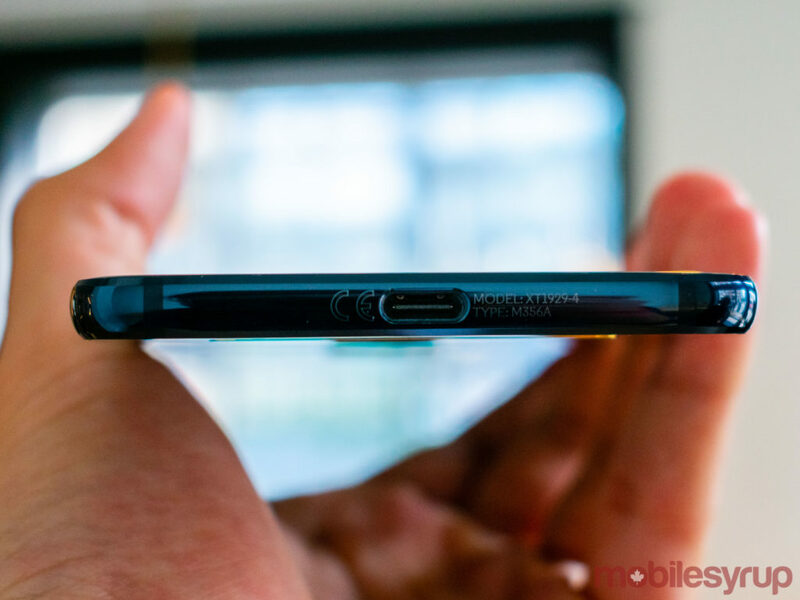 The phone’s sleek glass back subtly shows off the Z3 Play’s camera bump while also highlighting the magnetic pins required for Motorola’s Moto Mods. Finally, an all-metal frame wraps neatly around the entire device, gently curving to ensure that users are able to comfortably hold the entire phone in one hand. 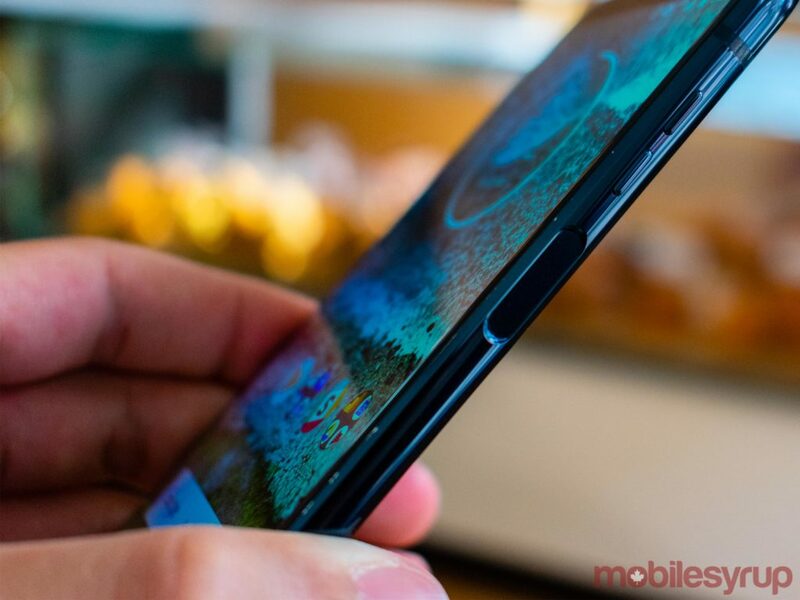 If there’s any reason to be critical of the Z3 Play, it’s the phone’s button placement. As a right-handed person, I’ve become accustomed to power buttons placed on devices’ right sides. As such, I was initially annoyed by Motorola’s decision to place the power button on the left side of the device, while placing the volume rocker just above the Z3 Play’s fingerprint sensor. However, having had the opportunity to use the Z3 Play for more than a month, I’ve come to terms with the device’s button placement, and am more than willing to excuse the phone for what I once considered a misstep. It should also be mentioned that the Z3 Play’s metal frame seems quite susceptible to nicks, scrapes and scratches. After only one month of use, the device’s frame has picked up a number of permanent scuffs. On the plus side, the phone is also splash-resistant thanks to a P2i nano-coating. You won’t be able to take the phone for a swim, but it will survive use in the rain and should survive most accidental spills. While the phone looks like a flagship device, the Z3 Play suffers from mid-range flaws. To begin with, the phone is powered by a Qualcomm Snapdragon 636 processor. That’s a direct upgrade over the Moto Z2 Play’s Snapdragon 626, the Snapdragon 636 is still one of Qualcomm’s mid-range processors. In addition to being significantly less powerful than the Snapdragon 845 found in this year’s premium-tier Android flagships, the Snapdragon 636 is less powerful than last year’s Snapdragon 835 and this year’s Snapdragon 660 — the processor found in other upper mid-range devices, like the BlackBerry KEY2. 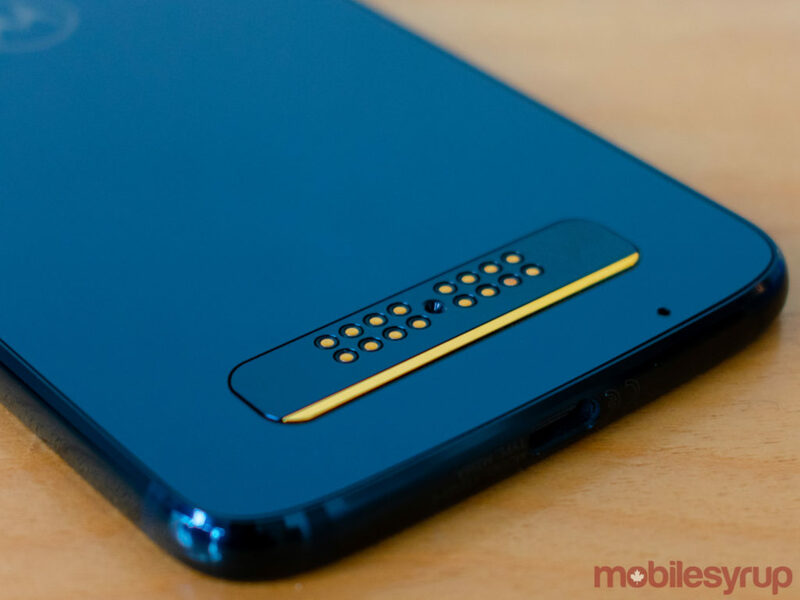 The Moto Z3 Play also comes with a relatively small 3,000mAh battery, 32GB of storage (upgradable to 2TB with a microSD card) and only 4GB of RAM in the Canadian model. As such, when compared to similarly priced devices, the Z3 Play’s specs are certainly underwhelming. However, once one looks past the basic numbers of it all, the Z3 Play is an absolute joy to use. The device’s Snapdragon 636 processor is capable of handling everything from resource-intensive apps to heavy, 3D-filled games. Additionally, the phone’s battery is able to provide a full day of use, even when burdened with excessive Pokemon GO gameplay, LTE and Wi-Fi audio streaming, Wi-Fi video streaming, as well as constant instant messaging. There’s no denying that the Z3 Play is a slower phone than devices powered by processors like the Snapdragon 835 or Snapdragon 845, but the manner in which Motorola has been able to maximize the full extent of the Snapdragon 636’s processing power is absolutely noteworthy. Since the company launched the Moto X in 2013, Motorola has maintained a minimalist approach to Android. 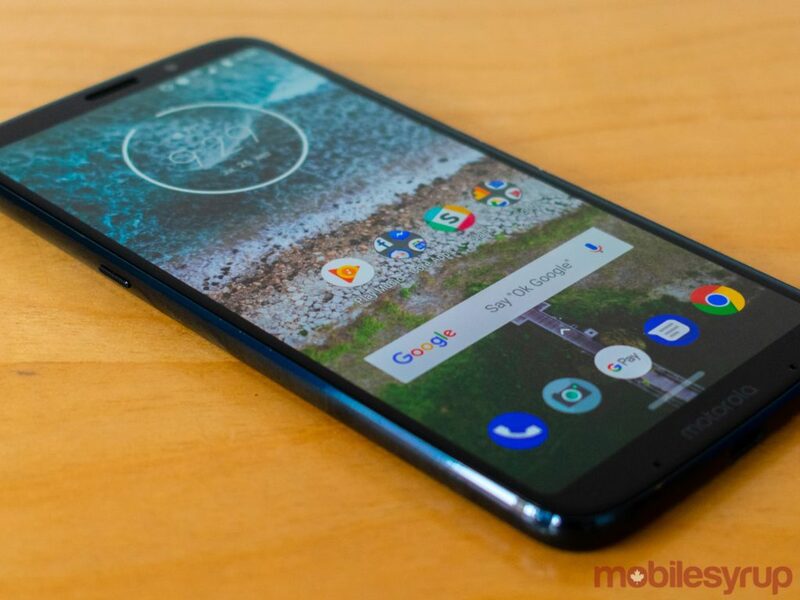 Unlike other Android hardware manufacturers, Motorola’s goal isn’t to sell users a heavily modified Android smartphone, but an Android smartphone that can stand in the same league as devices like the now-defunct Nexus line and the Pixel line. 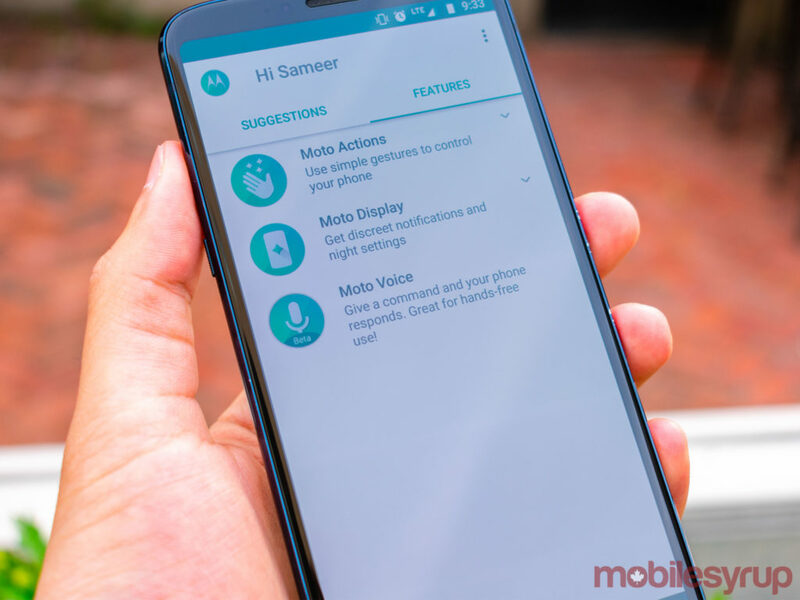 The Moto Z3 Play continues this tradition, providing users with an almost uninterrupted stock Android experience, customized with unobtrusive and welcome Motorola software tweaks. Like with previous Android Moto generations, the Z3 Play comes with a Moto app packed with features like Moto Actions, Moto Display and Moto Voice. Moto Display provides a ‘Night Display’ feature that warms the screen when activated (similar to Android’s built-in ‘Night Light’ feature); an ‘Attentive Display’ feature that keeps the screen turned on if the phone detects an active user; as well as the flagship ‘Moto Display’ feature, which activates the phone’s AMOLED display when users receive notifications. 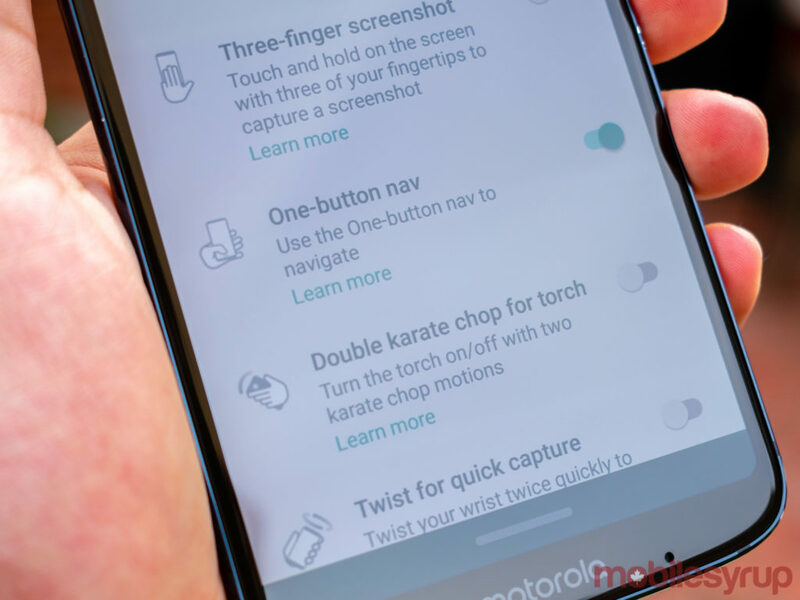 Additionally, most of the Z3 Play’s Moto Actions — like ‘Three-finger screenshot’ and ‘Double karate chop for torch’ — will be familiar to most people who’ve used a Motorola Android smartphone in the past. 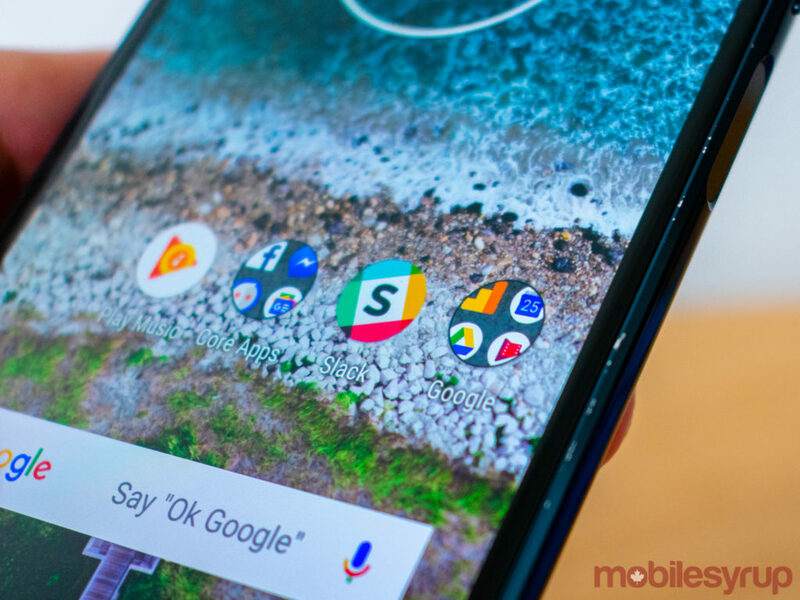 What’s new is a refined ‘One-button nav’ Moto Action, which replaces the Android navigation bar with a single, thin pill that acts as the device’s home button, back button and recents button. At first, the Z3 Play’s pill seems quite similar to the iPhone X’s gesture bar or Android P’s gesture pill. However, unlike the iPhone X and Android P, which use gestures for navigation, the Z3 Play’s navigation pill simply mimics Motorola’s fingerprint sensor navigation gestures introduced with last year’s Moto G5. Unlike the fingerprint navigation gestures, however, the Z3 Play’s navigation pill is far more intuitive and feels far more responsive. I’ve been using the navigation pill since I got the phone, and I’m a firm believer in its utility and overall simplicity. Of course, the navigation pill is optional, and users can easily toggle to Android’s default navigation bar. 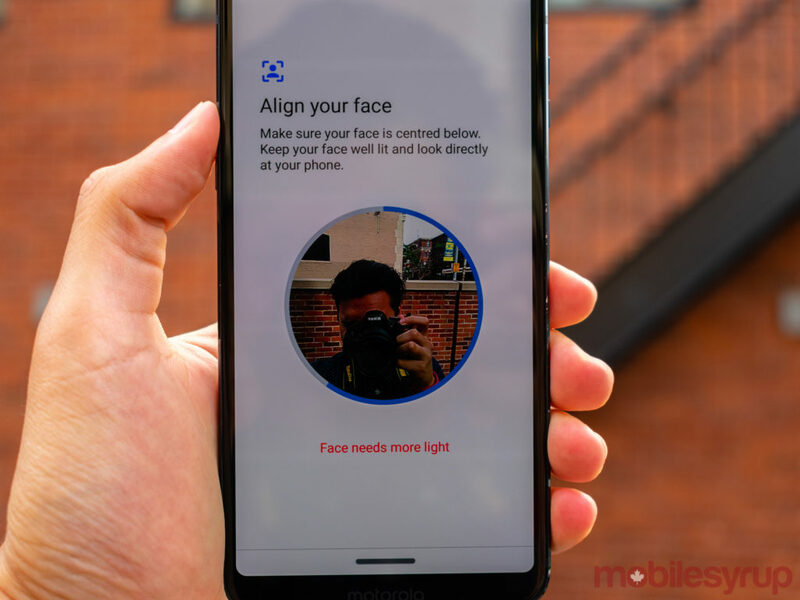 It’s worth noting that the Moto Z3 Play comes equipped with a ‘Face unlock’ facial recognition feature. In use, Face Unlock is speedy and effective, though for the sake of privacy and security, I quickly disabled the feature after my testing. I wasn’t able to fool Face unlock with a photograph, but I still personally prefer the security afforded through more effective forms of biometric security — like fingerprint scanners. While Motorola has always been known for its device build quality and software experience, the company has lost points in the past for its oft-disappointing smartphone cameras. Moto apologists and mobile photography enthusiasts alike will be pleased to know that this year’s Moto Z3 Play quite possibly has one of the best camera experiences on a Moto smartphone ever. Photos taken using the Z3 Play’s 12-megapixel and 5-megapixel rear-facing cameras are sharp, colourful, and vivid. Additionally, the camera itself is speedy to launch and quick to focus. The phone’s camera shoots pretty photos in low-light and bright conditions, while a number of camera effects — including portrait mode — make use of the Z3 Play’s new dual rear-facing camera setup. Other camera effects include ‘Cinemagraph,’ which allows users to form looping gifs created from recorded videos; ‘Spot colour,’ a returning effect that can remove all but one colour from an image; and ‘Cutout,’ which allows users to literally cut out a subject from a photo and transplant them into a new image with a different background. These effects all work to varying degrees of quality and varying levels of utility. While they’re interesting and fun to play with for a short time, very few people should make the decision to purchase a Z3 Play based on these camera tricks alone. 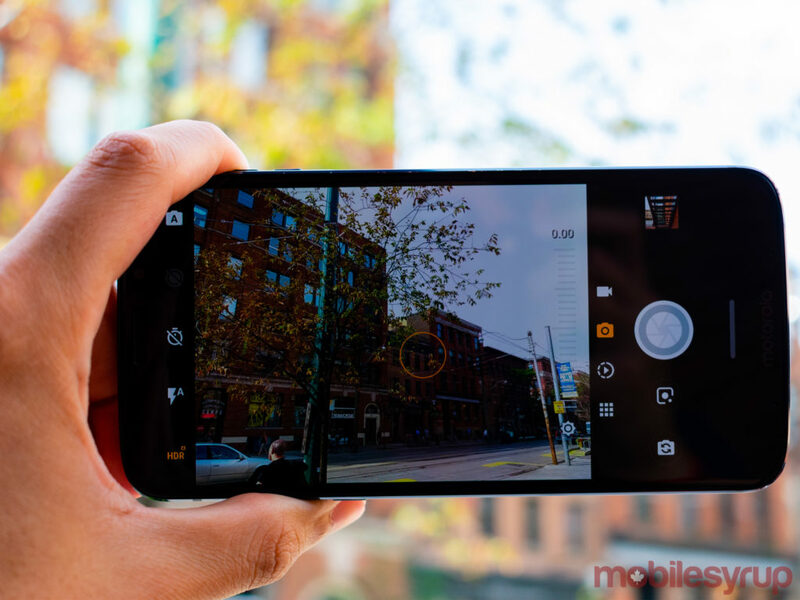 After all, many of the phone’s camera quirks can be replicated on any Android phone using a variety of free and paid apps available on the Google Play Store. The Z3 Play is also capable of recording 4K Ultra HD video at 30 frames-per-second, in addition to Full HD 1080p video at 30 and 60 frames-per-second. The phone is even capable of recording slow motion video. Sadly, despite the Z3 Play’s impressive suite of onboard software tweaks, the device’s camera still can’t compete with top-notch premium mobile shooters like the ones found on the Samsung Galaxy S9/S9+, the iPhone X, the Google Pixel 2, the Huawei P20 Pro or the Sony Xperia XZ2/XZ2 Compact. Each of those aforementioned devices shoots better photos and record better videos, and even offer more advanced slow motion recording features. Admittedly, it’s unfair to compare the camera on an upper mid-range smartphone against the cameras found in premium-tier devices, but due to the Z3 Play’s price tag, it’s equally unfair to compare its camera against its spec equivalents that cost far less. As much as I’d like to say that the Z3 Play’s camera is worth the device’s cost, the truth is that the Z3 Play’s camera isn’t worth $800. 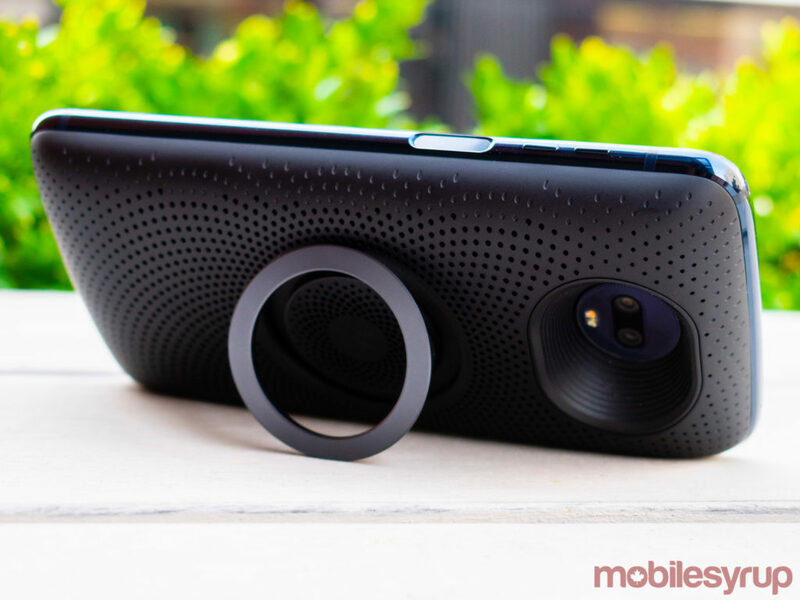 That subject of cost is made all the more flagrant when one considers that the Moto Z3 Play is compatible with the full suite of existing Moto Mods. Everything from the $329 CAD Hasselblad mod to the $259 CAD Polaroid photo printer mod to the $126 CAD JBL speaker mod work with the Z3 Play. However, the issue is that these mods are an additional set of costs on top of the phone’s already substantial $800 price. If you’ve already got older Moto Mods lying around, then the Moto Z3 Play will offer a welcome bit of backwards compatibility. 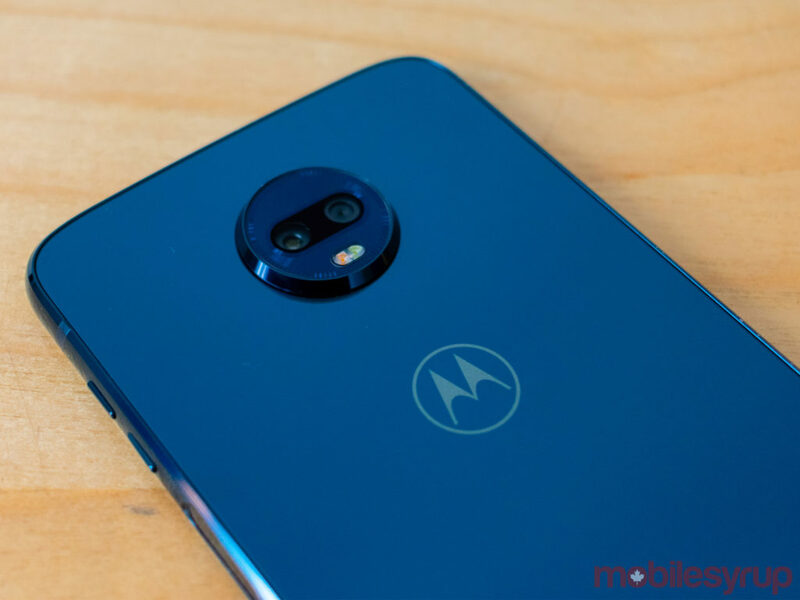 If you don’t have any Moto Mods, then keep that in mind before deciding on the Z3 Play. It’s worth noting that Moto Z3 Play devices purchased in the U.S. come with the Moto Power Pack mod for free. While this combo isn’t available for Canadian buyers, Moto Z3 Play devices purchased through Virgin Mobile between July 4th and July 31st, 2018 come with a free Polaroid Insta-share Printer mod. Motorola also makes it quite easy to purchase new Moto Mods, as the Z3 Play comes with a ‘Moto Z Market’ app that quickly connects users with the online Motorola store. The Moto Z Market app is clearly a blatant attempt on Motorola’s part to sells users additional products, but it does streamline the Moto Mod shopping process. As this review has already noted, the Moto Z3 Play costs $800 if purchased outright from Bell or Virgin Mobile. However, if purchased from SaskTel or Videotron, the device costs $700 outright. 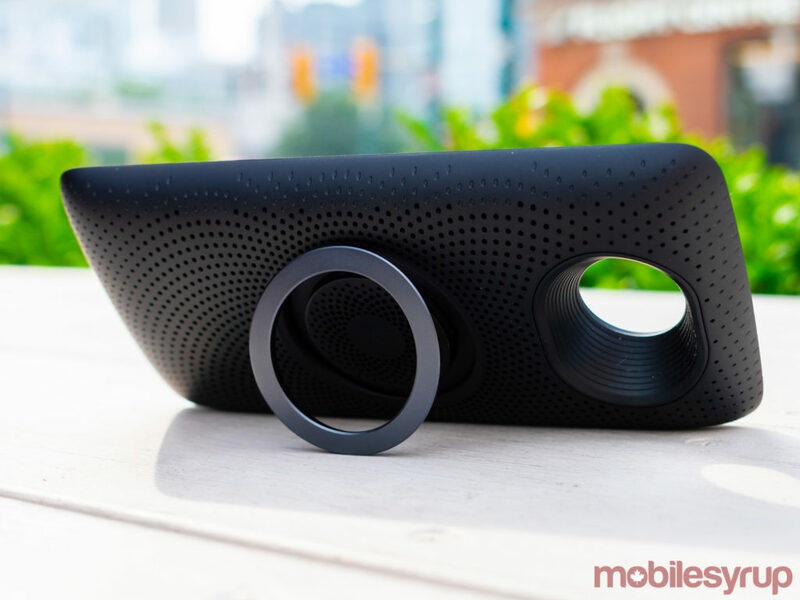 The device costs $0 on a two-year Bell contract; it starts at $149.95 on a two-year Videotron contract; it starts at $649.99 on a two-year Virgin contract; and it starts at $199.99 on a two-year SaskTel contract. While the Moto Z3 Play might be the best Z-series smartphone ever released by Motorola, its hefty price tag makes it a difficult device to recommend to anyone looking for a new phone. Still, for Moto Z2 Play users looking for an upgrade, or for those users committed to Motorola’s Moto Mods ecosystem, the Z3 Play makes a wonderful daily driver. "The Moto Z3 Play is one of the best upper mid-range smartphones released this year."